The Interventional Cardiology and Radiology Department at the Lebanese Hospital Geitaoui-UMC provides a broad spectrum of diagnostic tests and non-surgical interventional treatments for patients with cardiovascular diseases such as congenital heart disease, coronary heart disease, heart valve disease and peripheral artery disease. 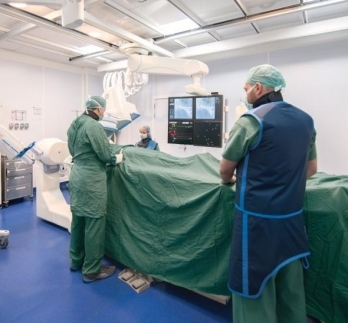 Our experienced interventional cardiologists and radiologists perform more than 1,500 non-invasive and catheter-based procedures each year, including coronarography, angiography, angioplasty and stenting, as well as pain relieving anesthesiology procedures. They also take in charge all cardiac emergencies 24/24, and 7/7, according to the best practice guidelines. They lead a team of multidisciplinary specialists, collaborating with specialists in anesthesiology, radiology, and vascular surgery. Along with experienced nurses and specially trained technicians, these specialists provide high quality, innovative care for patients requiring percutaneous coronary and vascular interventions. This clinical expertise is enhanced by the team’s access to the best in medical technology and equipments at our Catheterization Laboratory. Our teams of interventional specialists and nurse practitioners coordinate a patient's complete care—from imaging evaluation to post-procedure follow up—maintaining a high level of communication with the patient and the referring physician throughout the process.